As some of you know, I am a Reiki Master Teacher, and I have been making Reiki infused candles with added prayers of positive intent. I sell them at the events that I attend and recently opened an Etsy Shop as well. This past weekend I attended Spirit Quest at the Veasey Memorial Park in Groveland, MA. I was giving Angel Card readings and co-hosted a workshop on Dowsing with my friend, Maureen Wood. I was also selling my candles, but this year I brought something new! Ron always uses his special blend of protection spray during paranormal investigations to protect the members of the New England Ghost Project from unwanted spirit attachments and our electronic equipment from sudden battery drain. Ron, Maureen and I swear that it works. 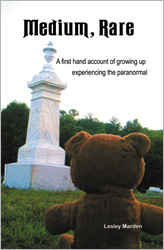 It is mentioned in the book Ghost Chronicles: A Medium and a Paranormal Scientist Investigate 17 True Hauntings, by Maureen Wood and Ron Kolek. People have been asking Ron for years if he could make them his special blend, and he and I have done just that. It comes packaged in an amber glass bottle, with Saint Michael’s Prayer and a silver cross. It contains a mixture of Holy Water, Sage Essential Oil, Cedarwood Essential Oil, Lavender Essential Oil and Whiskey. I also bless the bottles with Reiki and prayers of positive intent. You can find Van Helsing’s Special Blend Spiritual Smudge Spray at my Etsy shop. While you are there, please browse and favorite the items you like, so when you decide you would like the item you can find it quickly. Also available is my spirit smudge spray, Protect Me. Protect Me contains proven ancient protectants, including Sea Salt and Mustard Seed, as well as Sage Essential Oil, Cedarwood Essential Oil, Frankincense Essential Oil, Myrrh Essential Oil, Bergamot Essential Oil, Distilled Water and is infused with Reiki and prayers of positive intent. Previous Previous post: When You Are Online What Are You Connected To?